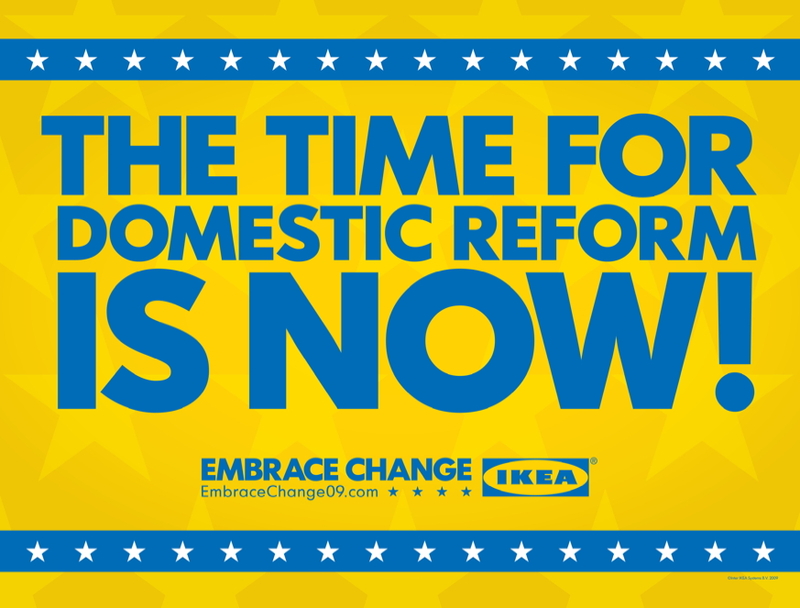 Through this week, IKEA's "Embrace Change '09" campaign will park its "fiscally responsible" version of the Oval Office in Union Station, where Joe Plumbers of all stripes can sit in the President's chair. Visitors will also be invited to sign a guestbook welcoming Obama and his family to the White House (where the book will eventually be delivered). Next week, the website (linked above) will enable site visitors to design their own virtual Oval Office. Register for a chance to win furnishings; three runners-up will get IKEA gift cards valued at $1500. Hey, brother, that could buy you three EKTORP couches. They didn't even take the time to steam the two American flags. Visual fail. IKEA in the white house? Please. Another part of this campaign consists of driving a fleet of limos and suvs around dc for 2 days wasting gasoline in the name of promotion. There's a protest and petition about it going around - www.ikeafans.com/blog has articles and more info. They also have them in the Gallery Place/Chinatown stop, in addition to Union Station. In fact, it's most prevalent there. I also liked the mock motorcade they planned through DC during inauguration week. Overall, this was a great campaign that combined a number of different elements across many different mediums into one fluid experience that was both fun and timely.